Mama Bean Parenting: "Should All Moms Have Paid Maternity Leave?" 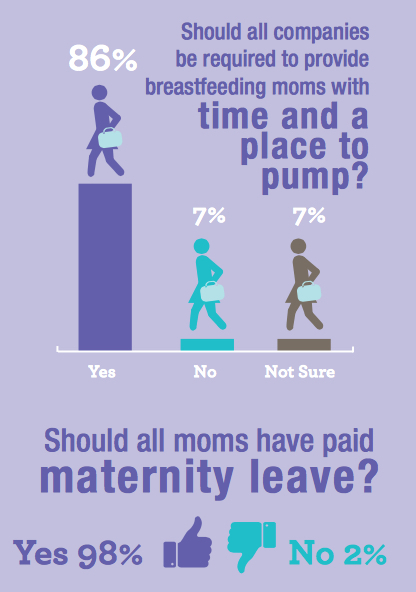 "Should All Moms Have Paid Maternity Leave?" We might be waving farewell to World Breastfeeding Week, but August remains a time to focus on breastfeeding (well, every month of the year is a time to focus on breastfeeding over here at Mama Bean Parenting, but that's by the by.) Because August is Breastfeeding Awareness Month, and what better way to bring awareness to a topic than to start a conversation about it? So when this year's Lansinoh Global Breastfeeding Survey landed in my inbox, I was ready to listen (metaphorically speaking). Because here is a survey that canvassed the opinions of over 13,000 moms worldwide. Quite simply, here is a survey that's starting a conversation. "Breastfeeding And Work: Let's Make It Work!" This year's World Breastfeeding Week theme was "Breastfeeding And Work: Let's Make It Work!" and for moms in countries with protected paid maternity leave, this sentiment seems possible. Because new moms with maternity leave are allowed time with their babies; time to learn the art of breastfeeding and time to relax into motherhood. To me, these allowances should be entitlements. Shouldn't all moms - regardless of location - be entitled to all aspects of motherhood; including breastfeeding? Yet for moms in the US, for example, protected maternity leave is simply not supported by the state and being far from an entitlement - it is a lucky win for just a small minority of new moms. What the Lansinoh survey results show us, is that this disentitled version of motherhood is not accepted by moms. We hear about it often, through murmurings or timeline vents, but we don't often get to see the scale of this opinion. Can you hear us, government? It is 2015 and moms, real hard-working moms, are sacrificing or compromising their breastfeeding relationships due to your lack of maternity legislation. Because breastfeeding can be hard! Physically, emotionally and unfortunately, socially. Moms need time; time to master the skill and time to bond with our babies...without the financial burden of unpaid leave and without a ticking clock over our heads, reminding us of our all-too-soon back-to-work date. Let me just lay this out clearly...a support network is the answer to every single one of these challenges. I don't know what I would have done without the support of my lactation consultant. Without those 4 important words..."you can do this"...I might have stopped searching for the reasons behind the pain. Without her advice and guidance along my longer-than-average breastfeeding learning curve, and without the cheerleading of a few valued friends, I might have assumed that I just wasn't cut out to breastfeed. Because there really is strength in shared experience. There is strength to be found in knowing that our experiences, with their highs and lows - their difficulties and triumphs, are Oh So Very Normal. Survey details: Lansinoh Laboratories Inc. Yes!! I love this so much - the connection between breastfeeding and maternity leave is so clear to me, I just don't understand how this isn't a given! Moms need time with their babies - for the good of society! We need more articles like this! We need to get this point out there and secure some real protection for working moms!